"We're not exactly what each other wants in a sexual partner, y'know? Well, for example, she wishes I looked a little more like Charles Bronson. And, ah, I wish she looked less like Charles Bronson." Sometimes you just want to watch a show where you know everybody's name. Rarely has a primetime sitcom contained an ensemble as talented, sophisticated, and distinguished as the cast of Cheers. The first season introduced the characters to America and established the world of Sam Malone's bar. The second season developed the relationship between Ted Danson's bartender Sam and Shelley Long's stuff-shirt waitress Diane Chambers. But, the third season was when everybody really hit their groove. Much has happened since that fateful day when Diane first walked into Cheers two years earlier. She and Sam went through a disastrous relationship that ended badly. Sam, following the break-up, has hit the bottle again and Diane has suffered a nervous breakdown that landed her in a mental hospital. But Ernie "Coach" Pantusso (Nicholas Colasanto) can't stand to see Sam drinking and convinces Diane to return, which she does with her new lover Frasier Crane (Kelsey Grammer, in his career defining role�literally). Thus begins the third season of Cheers. To fans of the show many of the dynamics that are introduced in this season are some of the best, particularly the love triangle of Sam, Diane, and Frasier. This is particularly well illustrated in episode three, I Call Your Name, where Frasier is sent into a frenzy when Diane cries out Sam's name in bed. Especially humorous is the scene where Frasier comes to Sam for counseling, a complete reversal of the season's premiere when Frasier counseled Sam back onto the wagon. There's also the continuing of many beloved running gags relating to the bar's regulars: Carla (Rhea Perlman), Norm (George Wendt), and Cliff (John Ratzenberger). The character of Vera, Norm's unseen wife, becomes a staple in Cheers mythology, especially with the hilarious opening of Coach in Love (Part 2). Not to mention, Carla's ex-husband, the scummy, resurfacing Nick Tortelli (Dan Hedaya), returns when his new wife, Loretta (Jean Kasem), throws him out in If Ever I Would Leave You. And the friendship between Norm and Cliff is challenged when Cliff leaves Norm in jail after the police bust him for finishing Cliff's mail route in The Mail Goes to Jail. What truly stands out about this season, however, is the level of sophistication that the writing rose to. Creators Glen and Les Charles, along with the writing staff, knew how to allow a joke evolve over the course of a conversation. Unlike today's sitcoms that feature constant one-line zingers, the heart of the humor featured in Cheers is character and situation driven. Take for example the scene in Whodunit? where Carla confesses to Diane that she is pregnant with her sixth child. Both women are allowed to address the seriousness of yet another pregnancy for an unmarried waitress, while subtle jokes are supplied only to accentuate the situation without overwhelming it. Some of the best writing in this season relates to Coach, such as when he has a girlfriend. Events drive a wedge between Coach and his bride-to-be, but the writing is so bittersweet and understated that the effect lasts well after the closing credits roll. Accompanying the writing and acting is the direction of James Burrows. Burrows directed every episode (all 25 of them!) in the third season and his efforts are evident. The writing of each episode allows them to stand alone, but Burrows' direction ties them all together to create a cohesive whole. His work in the season finale, Rescue Me, is worthy of note. Without giving too much away, let it be said that Burrows succeeds at doing something many feature length directors are unable to do�he successfully fools the audience into believing a dream sequence. Apart from Burrows direction, the technical craftsmen deserve much praise for their work. Bold strokes are made here in advancing the medium of television, especially the use of a tracking shot to begin The Heart is a Lonely Snipehunter. The framing of bar stools, glasses, and the bar rail create pleasant images that grant an aesthetic quality rarely seen on television. Even though this season of Cheers is nearly flawless, problems do arise towards the end. Nicholas Colasanto was sick during filming, and eventually passed away, which might explain why the final eight episodes feel somewhat awkward. Excuses are added in to explain Coach's disappearance, but none of them feel natural (who would believe that Coach's sister is so stupid as to drive all the way from Minnesota to Boston when he tells her to pick him up at the airport?). Another problem is that after Colasanto died, Coach is not even mentioned. The very least that the writers could have done would have been to re-write the ending to pay tribute to Coach, since he was the soul of the show up to that point. However, after nearly 20 years, Cheers tastes like a fine vintage wine. Few of the jokes are dated and the ability of the show to avoid cheap, predictable laughs in favor of genuine character moments is especially refreshing when viewed in today's shoddy, dopey sitcom saturated television line-up. Bottoms up, to the gang at Cheers! Image Transfer Review: Cheers is presented in its original aspect ratio of 1.33:1. This set contains very strong transfers for each episode, with very minimal grain or age. The fact that this was shot on film is not lost in the transfer, with colors being strong and depth being quite impressive. Some episodes contain print defects (especially on disc two), while others have none. Minor grain is present in stock footage shots of the bar's exterior, and sporadically throughout the 25 episodes in a few of the interior shots. Dirt rarely surfaces and edge-enhancement does not exist. For those who have only seen these episodes in syndication, this is a major step up. 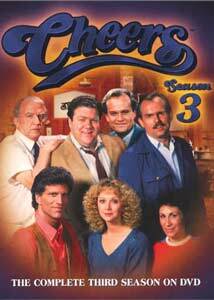 Audio Transfer Review: Cheers: The Complete Third Season gets a fitting sound mix in Dolby 2.0 stereo. Dialogue is clear and easily understood with a nice, soft use of the laugh track being spread throughout the front sound stage. In ProLogic, the famous theme song and score can be heard in the surround speakers. Bass is nonexistent, except during the opening and closing credits. For some reason, the show's theme song is a bit quiet in comparison to the rest of the mix. All in all, this is a proper presentation of the original sound mix. Extras Review: As usual, Paramount has skimped on the goodies. Only five brief featurettes are supplied�would it kill the cast and crew to record some commentaries? Or how about a sampling of TV commercials that ran during the original broadcasts? A retrospective documentary about the making of the third season would be nice. All of the features are on the fourth disc and have a separate menu from the episode guide. Virtual Vera (02m:52s) is a humorous collection of clips from the season relating to Norm's unseen wife. Next is Shrink-Warped: Introducing Frasier Crane (02m:48s), again, a humorous collection of clips from the season that highlight Frasier's involvement with the show. Unlike the other featurettes, this one does have some nice editingthat makes for some genuinely strong laughs. Following Frasier's introduction is Carla's Whipping Boy (03m:23s), which displays Carla and Cliff's witty exchanges. For those who are more interested in the behind-the-scenes aspects of the show, Cheers Bar Tour (hosted by the show's art director) takes you briefly into a few of the design ideas employed in the set and also compares the fictional Cheers bar to the actual Boston bar it is based on. The final extra is Nicholas Colasanto: His Final Season (06m:34s), which is a touching montage of interview and clip vignettes chronicling Colasanto's contributions as coach before his untimely death. Ted Danson, Rhea Perlman, and George Wendt all contribute interviews about Colasanto and his role in shaping the attitude on the set. Even though the series continued on successfully many years after Colasanto's death, it lost a great deal of soul when he passed on. This featurette helps in revealing his tremendous gift. Paramount has turned in a nice effort with the third season of Cheers. The image is rock solid and consistent between episodes. The sound is not especially dynamic, but it creates a nice listening environment for the viewer. The features are limited, but what's there is worth a look. However, the best thing about this set is the ability to watch 25 fine episodes of one of the best sitcoms of all time.